1) Infrared tube heaters emit soft, comfortable radiant heat energy without creating drafts. No blowing air can help prevent respiratory illnesses and enhance the overall health of horses and other animals. 2) General creature comfort is improved. Infrared heats the ground. Warm floors means warm bodies and warm feet. 3) Infrared, like light, can be directed at a target. 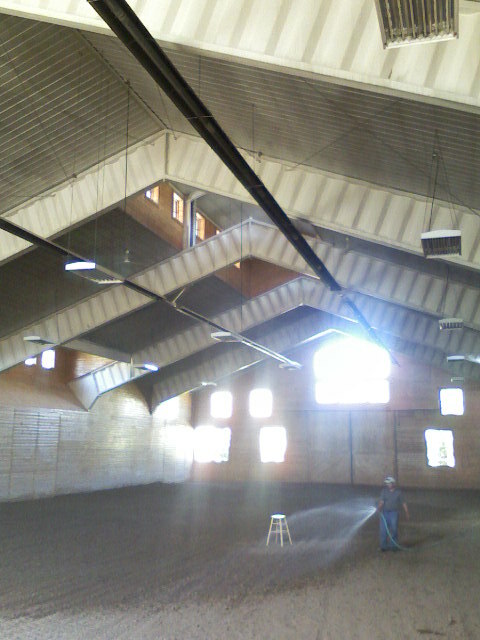 For barns, this can mean the horse wash area, dry off areas, stalls, aisle ways, or wherever the need for heat is greatest. 4) Energy savings and efficiency. Infrared heaters can be strategically mounted to throw radiant energy where it is needed, rather than to empty spaces. This tactical approach to heating space can save a boatload of money in operational expenses versus forced-air heating methods. 5) Infrared tube heaters are completely self contained. By drawing outside air into the burner at one end and venting products of combustion out the opposite end to the outside, the flame inside the heater is completely isolated from dusty and contaminated indoor air. This prolongs the life of the heater. 6) Animals like the feel of radiant warmth from the sun. An infrared heating system provides the same kind of comfort. Animals are generally happier and healthier. A tube heater consists of a burner box, which includes control components such a gas valve, circuit board, safety switch, etc.) Extending horizontally from the burner is a long 4” diameter 16 guage steel tube, anywhere from 10 to 70 feet in length. Positioned above is an aluminum parabolic reflector running over the length of the tube. When the burner comes on, a long flame shoots down the tube until it gets hot. The reflector ensures that heat energy that bounces out from the top portions of the tubing gets reflected downward to the floor area. The goal is to get all of that energy focussed downward. If you’re searching for a tube heating system, do a thorough online search first. Look for the best warranty, best construction quality, best reflective efficiency, and best serviceability among all brands. Then buy only from a company with a solid reputation in the infrared industry, a company capable of giving you the type of support that will merit your business. You should get a good price, of course, but make sure that whoever you buy from will be on hand to fulfill, guarantee and offer support to you down the road. Scott Workman is president and owner of Infra-Red Products Supply, Inc. and an expert since 1986 in gas infrared space heating systems. Want to learn more about barn heaters, workshop heaters, garage heaters, infrared tube heaters and more? Begin by visiting www.heatersunlimited.com or www.infraredinfo.com.